Our online jewelry store features dazzling accessories for every style and budget. Variety is one of the most important aspects of our boutique, allowing you the opportunity to discover styles, stones, and opportunities you might otherwise miss. We spotlight the most popular, distinctive, and inspiring accessories with special deals and organize the bestsellers into collections grouped by theme to make browsing easier and more rewarding. One of the most important deals is the limited-time Luxury Deal of the Week. Each week, our experts choose to highlight a high-end item from our online store with a short-term discount. Most of the items chosen to be Luxury Deals of the Week are favorite choices for online window-shopping, often admired by visitors for their sheer visual appeal. The Deal of the Week makes these items accessible to a much wider audience of visitors, enabling buyers to enjoy the peak of high-fashion luxury for an affordable price. Right now, the Luxury Deal of the Week is a 1/2 Carat Diamond Three Stone Ring in 10K White Gold. 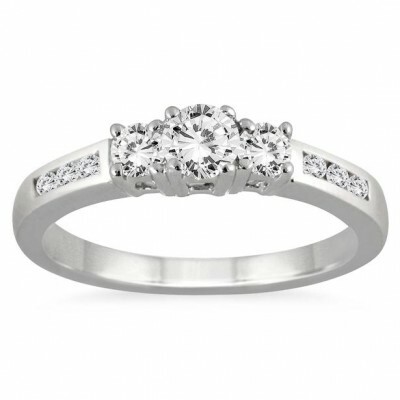 It is a classic three stone ring that features a channel set side of diamond, set in solid 10k white gold. The center diamond weighs .25 carats and is flanked by 2 diamonds weighing .20 carats in total. 6 side stones weigh approximately .05 carats in total. This amazing piece is an essential in every diamond jewelry collection. Check out http://www.szul.com/lux for the Luxury Deal of the Week and http://www.szul.com/szd for the Deal of the Day. You won’t miss these special deals if you follow us on social medias (Facebook, Twitter, Instagram and Pinterest). This entry was posted in Blog Posts, Sales and tagged Classic, Deal of the Day, Deals, Diamond, Diamonds, Jewelry, Love, Luxury, Luxury Deal of the Week, Ring, Specials, Three stone ring, White Gold. Bookmark the permalink.